There is something to be said for the recent resurgence of a certain brand of flair in the more independently-minded multiplex films. Whether for good (Don’t Breathe) or ill (La La Land), it is refreshing to see an assertion of directorial style in films made close to the auspices of the studio system, which lends a breath of fresh air to even the most seemingly concrete and inflexible of stock scenarios. Into this climate comes Edgar Wright, the celebrated English writer-director who, with Baby Driver, makes his American and action film debut. This is not to say that this is entirely unprecedented territory for Wright; he was originally slated to helm the United States-set Marvel’s Ant-Man before he left due to creative differences, and his 2007 film Hot Fuzz contains a substantial amount of suitably frenetic bouts of action. But there is a very different vibe and feeling at work in Wright’s latest film, something that uses the same objects of both homage and derision for something more straightforward and cool, if not altogether serious. Baby Driver is consequently both livened up and slightly weighed down by its influences, which include, among many others, The Driver, Thief, and Bottle Rocket. But they are all connected by Wright’s deft, wonderfully unsubtle touch, all beat-heavy music, tight edits, nicely executed earphone gags, and abundance of feeling. Baby Driver concerns itself with the well-trodden story of a man – really in this case a boy – trying to get out of his association with the seedier side of the law. Our hero is Baby (Ansel Elgort, very well-cast), a preternaturally gifted getaway driver, who perpetually listens to music on a veritable arsenal of iPods to drown out his tinnitus (sustained in an accident that left him an orphan). In between his daring feats for a rotating cast of crooks led by Doc (Kevin Spacey), he spends his time as a considerably goofier amateur musician, relaxing with his deaf foster father (a wonderfully warm CJ Jones) and eventually falling for Debora (Lily James, sweetly charming), the new waitress at the diner he frequents. Such a formula has been rolled out too many times to count, but what distinguishes it here is a collective effort from all involved to add some pizazz to the proceedings. Wright’s penchant for boldness is well-noted, but he works just as well with sly playfulness – the first scene after the opening chase, set to Bob & Earl’s “Harlem Shuffle,” is a one-take walking sequence whose background fantasia takes more cues from The Young Girls of Rochefort than La La Land – and, importantly, an intimate feeling for character. Just as in his previous film, a sincerity shines through in the ways the characters interact; even if there is more than a tinge of self-conscious stylization on hand, it is married to a genuine sense of feeling that gives each scene a charge, whether it be one of bliss or anger. And there is, uncharacteristically for Wright, much anger in Baby Driver. As Baby is coerced into yet another “one last heist” by Doc and his chances of escaping with Debora become more and more slim, the film moves into an ever more serious and legitimately dangerous vein. 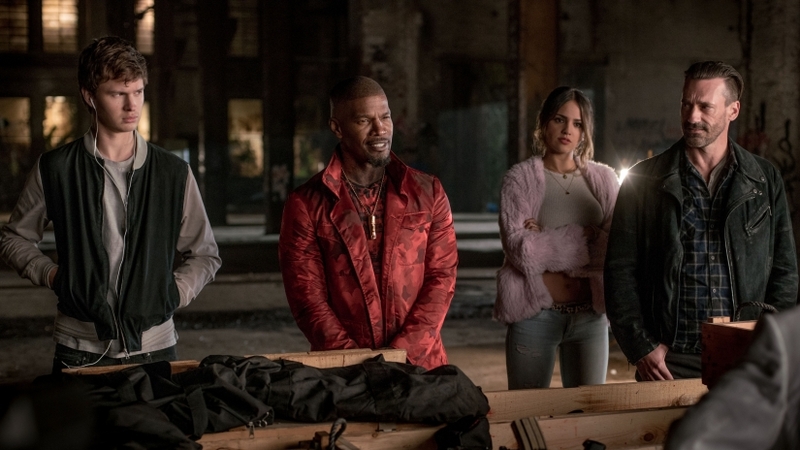 The laughs mostly die down, and genuine suspense floods through the various chases and evasions that Baby tries to navigate, complemented by marvelously executed heel turns from Jon Hamm, Eiza González, and Jaime Foxx, who still retain an enormous amount of charisma even as the situation grows ever more desperate. Perhaps this is the key to why Baby Driver seems to work almost in spite of itself, and why the flash of the cuts actually feel like they mean something. For all his technical charge, Edgar Wright loves his actors, and gives them just enough space to move around. Archetypes come alive in his films, and though this time around he comes close to losing the plot in grand notions of vengeance and macho heroism, there is more enough heart to go around, enough emotion conveyed in a set of glances, to sustain Baby Driver to the glorious end.